Adventure Playground Systems offers innovative shade and shelter solutions designed to ensure our customers are protected from mother nature’s harsh outdoor elements, including harmful UV Rays, extreme heat, wind and rain. 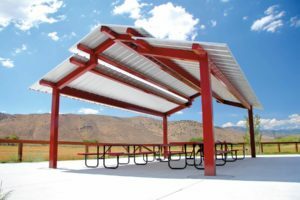 As an essential component of overall design and usability, shade protects not only the community in which it is placed but also your outdoor recreation investment for years to come. Adventure Playground System has over 20 years of experience providing high-quality engineered shade structures and metal shelters for a variety of outdoor venues. An Adventure Play Expert — with their unparalleled skill and expertise in design creation and installation — will guide you throughout each step of the design, manufacturing and installation processes. Why Do You Need Permanent Canopy Structures for Your Site? The sun can be a danger to both children and adults, especially if they’re outdoors for hours at a time. They can suffer anything from first-degree sunburns and dehydration to exhaustion and heatstroke. Unprotected park equipment can even heat to the point that it’s too hot to touch. Playground shade structures cover your entire play area, dropping overall temperatures up to 20 degrees. Marketing matters. The use of large outdoor shade structures extends past the simple playground and park. From restaurants and entertainment venues to daycares and HOAs, fabric shade structures have been used to define a space, brand a business and create a welcoming atmosphere — assuring areas look great while also providing functionality. These structures protect your investment. If you’ve invested in quality play equipment, you don’t want it to age prematurely or show fading colors. Even if you have commercial grade equipment, the sun can damage it over time. Commercial canopies shade your park and recreation products, protecting your investment from up to 97 percent of harmful UV damage. Aside from offering protection, allowing a more aesthetic appearance and protecting your investment, our canopy structures are designed specifically to meet your needs. Adventure Playground Systems can customize an order to meet your specifications. What to Keep in Mind When Looking at Canopies for Sale? Durability ensures that your investment is long-lasting and that safety remains a top priority. You also want to be sure your shade investment is able to withstand the outdoor weather conditions. Adventure Playground commercial shade structures are more durable and can withstand inclement weather, making them a smarter long-term investment. They’re specifically constructed for tension structures with the natural strength of knitted lock-stitch construction — using a blend of monofilament yarn and tape produces a dimensionally stable material that’s fray and tear resistant. Utilizing the highest quality commercial grade HDPE fabric ensures dimensional stability and stretch resistance for maximum performance as well as exceptional sun blocking capability. Adventure Playground Systems’ design team will assist you in choosing the best option for your space and climate — superior durability that lasts year after year. Depending on the what type of space or venue you’re looking to place your shade structure in, the size and style needed will vary. We offer a large selection of both standard and custom designed shade structures that can accommodate a wide variety of outdoor venues. Whether you are looking to cover a picnic area, aquatic venue, playground, parking lot or any other outdoor space. Adventure Playground Systems offers various shapes, sizes and styles — whatever your needs may be, we have a solution for you. In addition to improving the aesthetic appeal of your outdoor space, the color of your shade structure should complement the existing surroundings. Maybe you want to choose a pop of color that adds excitement, or you may wish to opt for a more calming natural shade. You can even select colors that match your school colors or company branding. We have a vast array of colors options for the powder coated frames and fabric canopies. An Adventure Play Expert — who specializes in design — can assist you in making the right color choice. Above all, size and design can vary greatly from one shade structure to another. Hip Roof Shades are our most popular design as they are both cost-effective and visually appealing. This versatile shade design comes in a number of different shapes and size options to help accommodate all of your shade needs. The custom possibilities are endless making this an ideal shade solution for a wide range of outdoor areas. They are the perfect shade structures for playgrounds, outdoor seating areas, swimming pools, automotive facilities or any another sunny site. Our hip roof shades will offer shade protection while accenting the existing surroundings. Cantilever Shade Structures are ideal for areas requiring shade but with limited space for columns or posts. A cantilever post is used to provide structure using vertical supports as opposed to additional horizontal posts. These designs are widely popular in the automotive industry, residential areas, and in recreational facilities. Our wide variety of designs styles and size options make this a perfect shade solution for a wide variety of outdoor areas. Our Umbrella Shade structures are both aesthetically simple and stylish. This design utilizes a single center mounted structural post to support a commercial grade shade net. They are the perfect shade option for outdoor dining areas, swimming pools, restaurants or any another sunny site. At Adventure Playground Systems we offer a full spectrum of Metal Shelters that create community spaces while helping protect patrons from many of nature’s elements. Using only the highest quality materials, our shelters are built to last and are engineered to withstand wind gusts of up to 90 miles per hour and snow loads of up to 20 lbs. per square foot. We offer both standard shapes and custom designed metal shelters in a variety of color options for the frame powder coating and metal roofing color panels. 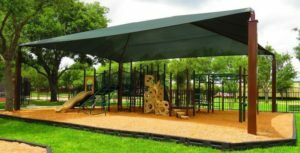 We are committed to providing the perfect metal shade covers for playgrounds, parks, daycares, or multi-family properties. Adventure Playground Systems offers high-quality engineered shade structures and metal shelters to accommodate a wide variety of outdoor venues. With over 20 years of experience, we ensure our designs provide aesthetically pleasing options to extend the life of your equipment while providing superior protection from the sun’s harmful UV rays. Our shade cloth fabrics are crafted from premium quality, UV-stabilized, high-density polyethylene, which delivers the ultimate combination of maximum sun protection, durability and strength. Our Adventure Shade line features both standard and custom shade solutions. With a large selection of color options for the powder-coated frame and fabric canopies, we can customize your structure to perfectly accent your existing surroundings. We’re committed to providing the perfect shade structure to meet all of your facility, park and playground needs. At Adventure Playground Systems, we take pride in being a USA manufacturer that specializes in producing a wide range of quality play and park products. Based in Houston, Texas, we have over 20 years of experience in the manufacturing of high-quality engineered Custom Shade Canopies and Metal Shelters. Our commercial-grade shade and shelter products are designed to protect your community from Mother Nature’s many elements such as sun, heat, hail and UV rays. Ready to buy a playground shade canopy or commercial sun shades for your outdoor recreational space? If you have additional questions or need help designing custom shade solutions, contact one of our Adventure Play Experts by calling 1-888-935-2112 or filling out our online form.